Mako is currently in soft opening at SeaWorld Orlando and I got to ride it yesterday! It was incredible. The first drop and first turn are exhilarating and I won’t lie, I was somewhat terrified for a few seconds. It’s funny to me that a ride where you come up out of your seat so many times doesn’t have shoulder restraints. I guess they want to really allow you to feel the air time. I rode a second time in the front row and it was even more incredible. After the first drop and turn it’s a somewhat relaxing of a ride, even though I know we were traveling super fast because my ponytail was sticking straight out behind me the entire time! There’s no loops or upside-down moments, so it’s all about speed and air time. It’s a fun ride and one I’ll be riding every time I visit for sure. See the video for footage of the soft opening, my thoughts on the new coaster right after I rode it, check out some cool stuff in the gift shop and see all of the Shark’s Reef area theming that is now complete. You can also see lots of images of the beautiful area theming below! And stay tuned for more theme park updates coming soon. After a long wait, it’s finally here! New shirts featuring all 4 thrill rides, including Mako! Will go perfect in your new Mako frame! Seeing a hidden message: SHARKS. RARELY. HURT. PEOPLE. Size chart – for the coolest fish in the ocean! Learn with maps and charts! Look what made it onto the park map! That’s all for this update. Check back soon for more! See our last Mako update. 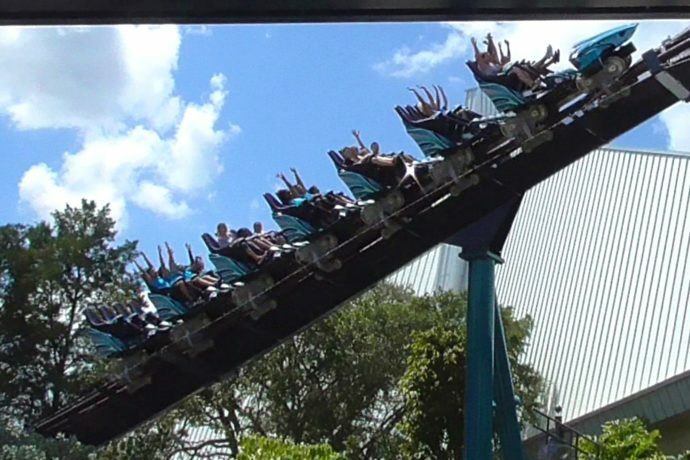 Check out all our Mako updates here and subscribe to the RSS Feed to stay on top of Orlando park news! And subscribe to my YouTube channel for more theme park videos and construction updates!